Home» Ethical Hacking | Window » What is a host file? And What can you do by using hosts files? Friends In this post you will know what is the host file? I am telling you this because its use is very much in hacking. 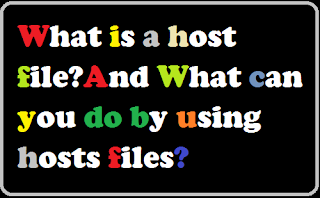 So, when you are learning advanced hacking, you need to know about hosts file before then. So friends know what the host file is? How To Recognize And Avoid A Phishing Page? What Are Some Best Hacking Techniques For Hackers? How To Create Facebook Phising Page And How To Hack Facebook Account Using Phising Page? How To Recover Deleted All Data On Facebook? What is a host file? The host file is a file from any operating system through which you can map hosts names and IPs, Let's say that you have a local domain name. You can map that domain name to any IP. This is a plain text file, but its use is very high. Friends, if you want to remember any website we can not remember his ip, To simplify this thing, the DNS (Domain Name System) was dropped because it was needed. With the help of the domain name, we can give a particular ip a name. But you should know that our system only understands the ip of the website and not its name. What can you do by using hosts files? You can do a lot by using the host file but here I am telling you about some important work. If you want to block any particular website in your computer, simply you can block those websites with the help of hosts files. Let's know how the website is blocked by the host file's help. Step1; First of all you open the host file on Notepad in the Administrator Mode. If you do not open the hosts file on the Administrator mode then you can not save it. Step2; After this website you want to block, Simply map that website to your local ip, like all the system's local ip is 127.0.0.1, then write the website (www.fb.com) in front of it and Save the host file. Now if you open these websites by going to your browser then they will not be open. So in this way you can block any website without any software. How do we redirect the website? 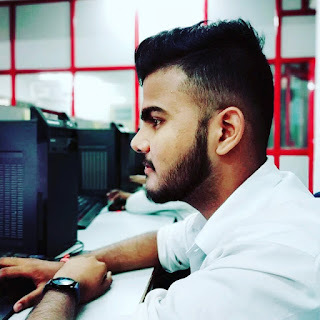 With the help of hosts file, Suppose you want to redirect to facebook.com, on google.com, you may have learned a little bit so that we can do all this by using the ip so let us Step by Step How do you know? Step1; First of all, we have to redirect google.com to facebook.com. To know the IP address, open the cmd command prompt and enter the command given below. Step4; Now let us redirect google to Facebook so simply add the google.com before and after the Facebook IP in the end of the host's file. Step5; Now if you open google.com on your web browser then facebook.com will be open. So in this way we can redirect any website. You have an ip and if you want to map it to the local domain name (ex google.com, abc.org), then you can do it easily with the help of hosts file. Let's see Friends by step by step How can we assign a domain name to local ip, from the help of hosts files. Step1; First you go to this location, go to windows drive c >> window folder >> system 32 >> driver >> etc folder, you will get a file named hosts. Step3; When you open the hosts file, you must add a line to the file at the bottom, first write the ip then write a domain name after giving a space, And save the hosts file. Step4; Now simply open your web browser and enter the domain name(abc.org) in the URL box, you will see that instead of abc.org, google.com will be open on your computer because you used Google's ip ad in the hosts file. So friends can we assign local domain names like this. The name of a website is very large. For example, if you want to make a short cut of www.google.com, then you can do it with the help of hosts files very easily. Step1; First of all , you open the hosts file. Step2; Now you write google's ip most end and write any short name like it g.com. Step3; Now save the hosts file, and by opening the browser, you enter g.com in the URL box, google.com will be open.